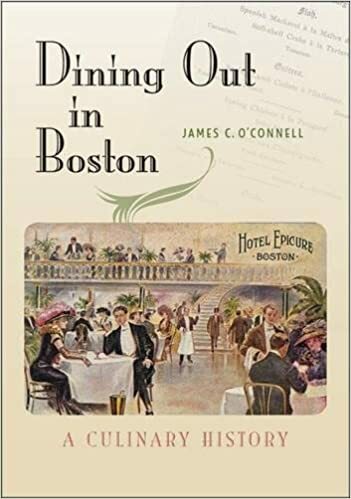 James O’Connell’s deeply researched, copiously illustrated history of food establishments in Beantown was published in October 2016; the author gave several talks in prime venues locally, starting with a launch party at Newtonville Books on Oct. 23, 2016. Dining Out in Boston is illuminated by over 50 illustrations and “close readings” of early menus and other culinary ephemera, making this new book an irresistible trove for foodies and students of Boston’s rise to greatness (from rather plain beginnings). James O’Connell also gives talks about his earlier (lavishly illustrated) books, The Hub’s Metropolis: Greater Boston’s Development from Railroad Suburbs to Smart Growth (MIT Press, 2013) and Becoming Cape Cod: Creating a Seaside Resort (UPNE, 2003). He’s an engaging presenter, often making use of PowerPoint for illustrative purposes, and really knows his material.